Are you a fishing enthusiast? Are you thinking of getting more fishes easily? Then you must be searching for the best fish finder to find the fishes. I must say you’ve come to the right place. A fish finder will take your fishing experience to the high level. It’ll make the whole thing easier and save your time on searching fishes under the water. You needn’t to waste your valuable time only on finding fishes. Turn your fish finder on, find best fishing location, start fishing and fill your bucket with fishes. Usually, the primary activity of a fish finder device is to find the best location for fishing where fishes are available. Basically, it’s a sonar device built for detecting fishes underwater. It detects fishes by its sound impulse reflection technology and shows the location on its display. 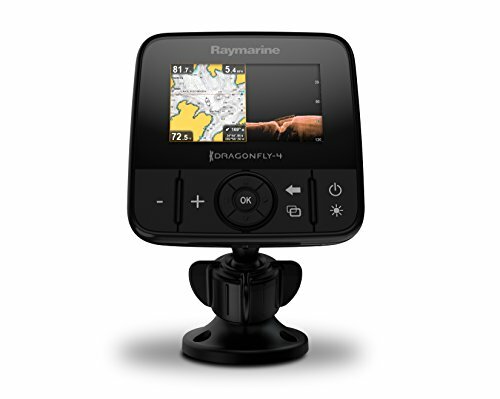 Raymarine Dragonfly 7 PRO is the advanced version of the award-winning fish finder Dragonfly 5 PRO. In my research and opinion, It’s the best down-imaging fish finder in the market. It comes with a bigger LCD display (7”), excellent design, GPS, Wi-Fi, CHIRP Sonar Technology. The wide LCD display with resolution 800x480 WVGA gives excellent picture. The CHIRP Sonar Technology provides more detail information of the underwater fishing spots and fish. It’ll also provide the picture of higher depth with extra clarity. The Wi-Fi connectivity is a great feature that allows you to stream the pictures in your smartphone, you just need to download the Raymarine Wi-Fish mobile app. You can take screenshots, save sonar logs on microSD storage cards. Its best performance is up to 600ft but it can perform in more depth. 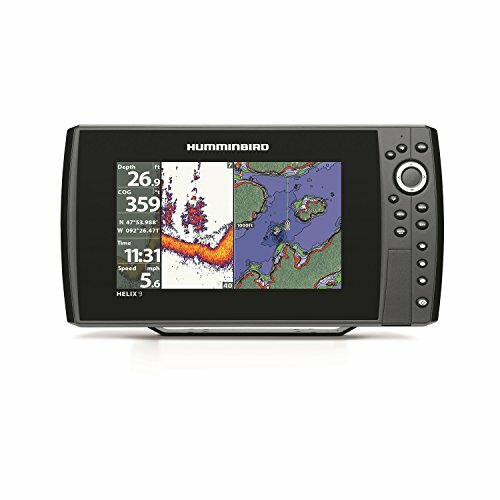 Humminbird HELIX 9 is one of the most advanced fish finder in the market. This device comes with a bigger 9” HD TFT display with resolution 800x480 pixels with real colors. This bright display gives maximum clarity in any situation. The main advantage of this device is that, it runs in two frequency modes (Higher & Lower) on CHIRP Sonar Technology. It works in 600ft of sonar depth with lower frequency and works up to 3000ft with higher frequency. The dual beam PLUS view with 20-degree beam is used for bottom details and 60-degree beam is used for observing wide area. So, it reaches everywhere underwater. It comes with GPS and upgradable software. This fish finder is easy to install in FISHING KAYAK. This small ball shaped fish finder comes with excellent design and quality. It uses your smartphone to display the result of finding fish since It has no display in it. It has built in GPS and Wi-Fi connectivity in the ball. 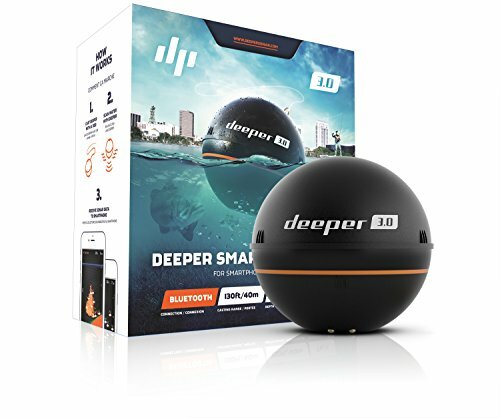 Basically, it floats on the water and mark anything up to depth of 130ft, with adjustable sensitivity; Connection range up to 130ft in clear conditions on the smartphone display. Though, the range is little but it is very effective with strong output. It is also compatible with tablets so you’ll get bigger display. It is small but worthy. 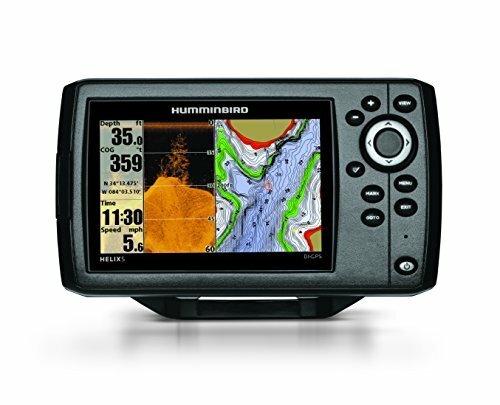 Humminbird Helix 7 series is the most popular fish finder in the market for a long time. 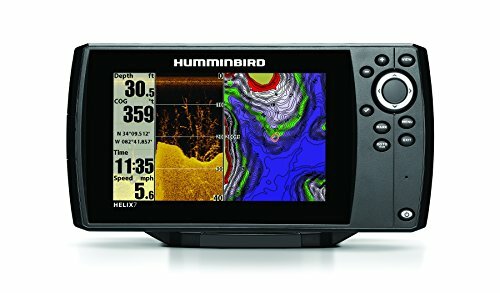 Humminbird Helix 7 DI is the down image version of this series with bigger and brighter display of resolution 800x480 pixels. One of the best down imaging fish finder that works very accurately. It comes with dual beam to find fish in wide and narrow area altogether. Though, narrow beam gives higher accuracy you can use wide beam for scanning larger area. It has the GPS features as well and microSD card reader to save your logs for future use. This HELIX 5 DI is another great fish finder for down imaging. It is slightly cheaper than the HELIX 7 series, so it is best in its price range. It comes with a 5” display of 800x480 resolution, GPS feature, SD card slot for saving data. It also has the dual beam PLUS feature to give it more accuracy to the results. You can operate it in either narrow beam or wide beam. The display is brighter even in sun. Its design is handy and durable, easy to operate. Selecting a fish finder is not so easy. Here are some key features to keep in mind when buying the best fish finder. Display is very important thing for a fish finder. You need to consider some display features like colorful or not, display size, resolution. A colorful display can give a better result than a black/white display because it gives detailed and clearer pictures of fish spots. You can easily identify fishes on the display while it’s difficult on black/white display. Next comes display size and resolution. The bigger display is more effective to identify the exact position where the fish are. Higher resolution will give sharper and realistic image. So, a minimum of 240x160 pixel resolution is recommended for a good picture. When you’re buying a fish finder, you’d know about frequency. If you go to shallow water, then higher frequency like 192 or 200 KHz is best for you. Otherwise, Lower frequency like 50 KHz is best for salt water. Higher frequency gives more details about the fish spots and lower frequency gives wider range. Now most of the devices come with dual frequency (Higher and Lower). So, you can switch frequency anytime based on your need. Power is one of the main factors of a fish finder. A good fish finder needs higher wattage as power is measured in wattage. If the power is higher, the device will work faster and give accurate result. Low powered fish finder is less effective showing the results. But, lower wattage can do the job in shallow water. So, 600 watts is good for shallow water otherwise 1000 watts’ device is recommended. A GPS option in the fish finder helps to find your previously found fishing spots. It minimizes your searching efforts. Most of the fish finders in the market come with a GPS System. Price is an important factor while buying a fish finder. You’d invest your sweet money on the product that meets all your needs. Remember that, the more features it has, the more it will cost. But, don’t miss the features discussed above when you buy your fish finder. So, what’s on your mind? We hope, we made your job easier to choose the best fish finder for you. You must be selected which one to buy. Please write to us if you have any queries. Happy Fishing.